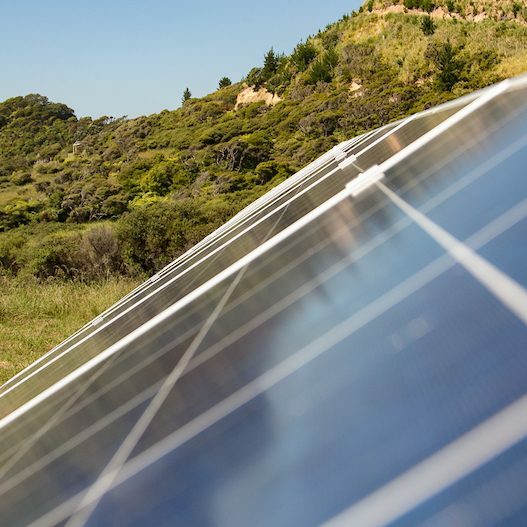 Solar Options is a family owned business based in Whakatane, the Sunshine Capital of New Zealand. For more than a decade Solar Options owners, Gerry and Simone Magner have lived and raised their two children in an eco-friendly, hi-spec, self-build home completely off-grid, enjoying an energy freedom lifestyle on Ohakana Island in Ohiwa Harbour. Gerard Magner, founder of Solar Options (NZ) Ltd knew all about utilising solar energy, having been involved in implementing and delivering solar solutions on projects in Australia, Ireland and now New Zealand. When it came to building the family home, it made perfect sense to go the eco friendly way. It had been a long time dream to build a fully self-sustainable, eco-friendly materials, solar powered, high spec, off-grid home. Returning to New Zealand in 2005, seeking a more tranquil lifestyle for our family in our own piece of paradise, we set about deigning our dream, fully living and breathing home. Wanting to build and live in a classified pristine area of New Zealand wasn’t without it’s challenges. With building and resource consents to obtain, logistical planning, appropriate building design and materials to consider, and of course, the energy concerns of the new build were the top priorities. With the individual nature and character of the build, considered innovative and ground breaking in 2004, causing delays to the consent process by two years. The delayed building commencement date afforded us the time to completely research best design and best building materials with specific consideration given to all possible renewable energy options. By the end of the consent process we were thoroughly confident that the only way to go was solar. Using the time to learn about our energy capacity and understand what our energy requirements would be, to run all the typical appliances that a home attached to the grid would have, this was the time to get the planning right. This home was a hi-spec, cutting edge modernist design that included some serious appliances and lighting requirements. This was our forever home and we were sure that this wasn’t going to culminate to a ‘camping’ experience. The beauty of a new build meant we could incorporate solar energy in to the design of our home from the ground up, way before any panels went on the roof. Good design, orientation and planning was the secret to the success of the build. The initial solar power components included a photovoltaic panel system, solar specific batteries for energy storing and an inverter to distribute the energy into the house. The other major priority our build was hot water and heating. By setting up a two solar hot water systems we were able to have more than enough hot water to easily meet the homes hot water requirements. Heating a modern home with 40% external glass surface required great consideration to design and planning. Installing double glazed windows, high insulation rating, passive solar heating and a circulating solar hot water underfloor and central heating system to heat a 225 sq m house without using a single fossil fuel was going to be a challenge. The building logistical challenges of transporting materials to an island presented a whole set of other issues. The entire build took 2 years to complete, being deliberate with solar right from the planning stage, meant the sustainable foot print and character of the house could be realised. At the end of 2007 we moved in to our living breathing, fully sustainable, off-grid, high tech home, proving that it is possible to live extremely comfortably and for solar homes to have all the modern conveniences associated with grid-tied powered house, but with a completely clear conscience. 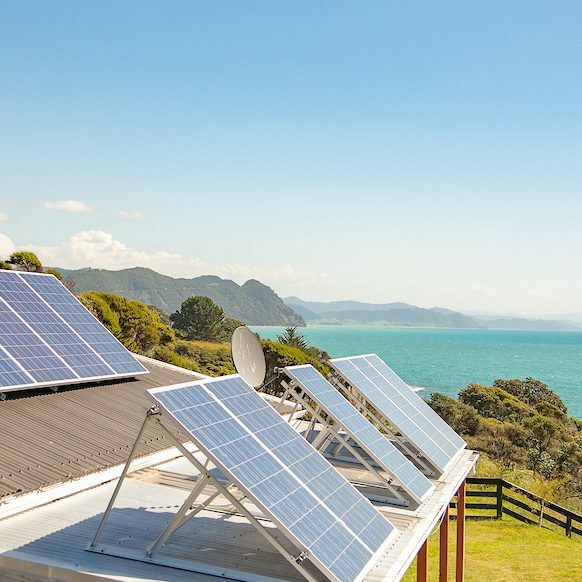 living off grid, on Ohakana Island on Ohiwa Harbour, in a home powered entirely by solar is so satisfying … drawing all our energy requirements from an abundant, limitless, natural resource … provides a great sense of lifestyle empowerment. Good news travels fast you could say! Before long we had many enquiries from remote, new and existing home builders wanting to know how we went solar. Essentially, we were pioneers in our locality of this kind of build. At that time their wasn’t a lot of information about solar energy and were very few solar products on the market. it wasn’t long before other families facing similar building remote issues, hefty electricity line connection costs in the several thousands of dollars, sought alternate energy options. Initially local Bay of Plenty families, just like us, wanted to replicate our eco-friendly, modern design, environmentally safe and no carbon footprint, lifestyle. Through our own build we had acquired valuable knowledge and information on sustainability, that we could share within our community. We were keen to share the benefits of an off-grid lifestyle, to encourage and show more families, how to take embark on an energy freedom lifestyle. The establishment of Solar Options in 2010, was a natural response to a local demand and interest in solar energy. Identifying a very real market and a genuine, growing interest in solar energy systems in their homes. Through our business we could share with other families the basic concept of living with solar and the sense of freedom and satisfaction that can be achieved by building and living in a totally living, breathing building. Through Solar Options we were also able to show existing and new home owners how solar energy, products can be incorporated into new and existing homes so that they too could avail of a free energy source, make savings and live in a more energy conscious home. It then became the mission of Solar Options to provide, reliable solar system products and consultancy that was accessible and affordable. Our idea was to share the success and satisfaction, offer sound advice, excellent high-quality products at reasonable prices and provide market confidence with an excellent back up service. With solar incorporated into more homes, the benefits had to impact on our community, fostering healthy, happy families. We have learnt that Solar is a lifestyle investment which will make real returns to any home.